Ten years. Actually 539 weeks. I’ve been recording my weight every morning from 23 October 2004, and adding a new data point to my chart every weekend. I’ve been recording my weight ever since I read that people who monitor their weight on a regular basis are more likely to avoid it ballooning upwards. There’s an instant feedback which allows me to seek adjustments in my personal health regime. With ten years of experience under my (varyingly-sized) belt, I’m strongly inclined to continue the experiment. The above chart started life on my Psion Series 5mx PDA. Week after week, I added data, and watched as the chart expanded. Eventually, the graph hit the limits of what could be displayed on a single screen on the S5mx (width = 480 pixels), so I had to split the chart into two. And then three. Finally, after a number of hardware failures in my stock of S5mx devices, I transferred the data into an Excel spreadsheet on my laptop several months ago. Among other advantages, it once again lets me see the entire picture. 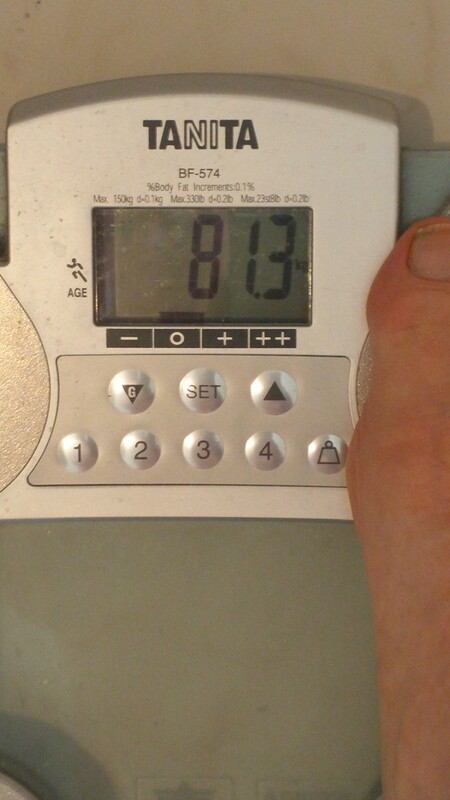 This morning, 14th Feb 2015, I saw the scales dip down to a point I had last reached in September 2006. This result seems to confirm the effectiveness of my latest dietary regime – which I’ve been following since July. Over these seven months, I’ve shrunk from a decidedly unhealthy (and unsightly) 97 kg down to 81 kg. In terms of the BMI metric (Body Mass Index), that’s a reduction from 31.2 – officially “obese” – down to 26.4. 26.4 is still “marginally overweight”, since, for men, the top end of the BMI scale for a “healthy weight for adults” is 24.9. With my height, that would mean a weight of 77 kg. So there’s still a small journey for me to travel. But I’m happy to celebrate this incremental improvement! BMI of 30 or more: a BMI above 30 is classified as obese. Being obese puts you at a raised risk of health problems such as heart disease, stroke and type 2 diabetes. Losing weight will bring significant health improvements..
As the full chart of my weight over the last ten years shows, I’ve had three major attempts at “action” to achieve a healthier body mass. The first: For a while in 2004 and 2005, I restricted myself to two Herbalife meal preparations a day – even when I was travelling. Renowned cardiologist William Davis explains how eliminating wheat from our diets can prevent fat storage, shrink unsightly bulges and reverse myriad health problems. Every day we eat food products made of wheat. As a result millions of people experience some form of adverse health effect, ranging from minor rashes and high blood sugar to the unattractive stomach bulges that preventative cardiologist William Davis calls ‘wheat bellies’. According to Davis, that fat has nothing to do with gluttony, sloth or too much butter: it’s down to the whole grain food products so many people eat for breakfast, lunch and dinner. After witnessing over 2,000 patients regain their health after giving up wheat, Davis reached the disturbing conclusion that wheat is the single largest contributor to the nationwide obesity epidemic – and its elimination is key to dramatic weight loss and optimal health. In Wheat Belly, Davis exposes the harmful effects of what is actually a product of genetic tinkering being sold to the public as ‘wheat’ and provides readers with a user-friendly, step-by-step plan to navigate a new, wheat-free lifestyle. Benefits include: substantial weight loss, correction of cholesterol abnormalities, relief from arthritis, mood benefits and prevention of heart disease. As a result, I cut back on carbohydrates – and was pleased to see my weight plummet once again. For a while – until I re-acquired many of my former carb-enjoying habits, whoops. That takes me to regime number three. This time, I’ve followed the more recent trend known as “5+2”. According to this idea, people can eat normally for, say, five days in the week, and then eat a very reduced amount of calories on the other two days (known as “fasting days”). My initial worry about this approach was that I wasn’t sure I’d eat sensible foods on the two low-calorie days. That’s when I ran across the meal preparations of the LighterLife company. These include soups, shakes, savoury meals, porridge, and bars. Each of these meals is just 150-200 calories. LighterLife suggest that people eat, on their low-calorie days, four of these meals. These preparations include sufficient proteins, fibre, and 100% of the recommended daily intake of key vitamins and minerals. In addition to eating less, I continue to do a lot of walking (e.g. between Waterloo Station and meeting locations in Central London), as well as other forms of exercise (like on the golf driving range or golf course). Note: I know that BMI is far from being a complete representation of personal healthiness. However, I view it as a good starting point. Our emotional relationship with food and how we can overcome it to revitalise our diets. Forget calorie counting and starving yourself and learn the truth about why we overeat in this fascinating, innovative guide. I’ll finish by thanking my friends, family, and colleagues for their gentle and thoughtful encouragement, over the years, for me to keep an eye on my body mass, and on the general goodness of what I eat. “Health is the first wealth”.